Have the kids design their very own Shiny Fish Collage. Where does the shine come from? Why Tin Foil of course! 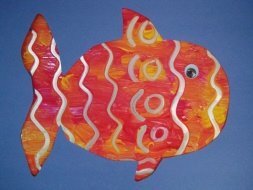 A great fish craft for Preschoolers on up! 1. Print out the fish template. You can either print it on construction paper (8½X11 size), and then cut out the fish; OR you can print it out on white paper, trace the fish onto the construction paper and then cut out. In the end what you need is a piece of construction paper with a fish cut out of the middle. 2. Cut a piece of tin foil a little smaller than the construction paper. Paint all over the foil. you can use one color or many. We used red and yellow, which made an orange where the colors ran into each other. Before the paint dries use Q tips to make a shiny design come through the paint. Slide the Q tip in the paint to make your design. You will need a few Q tips since they get filled with paint quickly and won't "erase" the paint well. 3. Once the paint is dry glue your foil onto the construction paper. Glue on your google eye, if you don't have any just use a small circle of white paper. You can also complete this craft by gluing on a solid sheet of construction paper onto the back.